Source: CICH graphic created using data adapted from Injury Section analysis of hospitalization data from the Canadian Institute for Health Information. http://www.phac-aspc.gc.ca/publicat/lcd-pcd97/table2-eng.php – accessed March 5th, 2017. 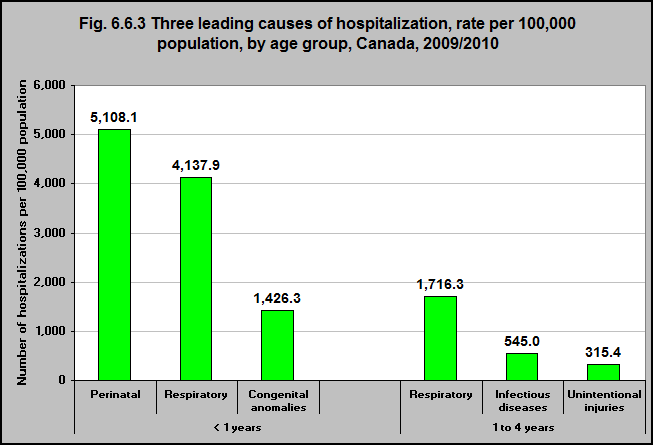 In 2009/10, respiratory illness was the leading cause of hospitalization for children aged 1 to 4. In 2009/10, there were 25,301 hospitalizations due to respiratory illness among children aged 1 to 4. The hospitalization rate was 1,716 per 100,000 children aged 1 to 4 years. In 2009/10 respiratory illness was the second leading cause of hospitalization among infants under 1 year. In 2009/10, there were 15,991 hospitalizations due to respiratory illness among infants under 1 year. The rate of hospitalization was 4,138 per 100,000 infants.